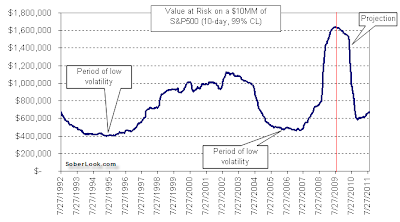 Since we are on the topic of banks, let's take a quick look at Value at Risk (VAR). It's a dollar measure used by banks to allocate trading limits as well as a tool regulators use for capital requirements on banks' trading activities (under the Basel Accord). In principal it is meant to measure the level of risk (potential losses) in a portfolio. In practice however it a simply function of historical volatility that an existing portfolio would have experienced if one held it intact over some historical period (such as 2 years). There has been debate and academic literature on the topic (see references) ad nauseam, particularly on what type of VAR constitutes a more "accurate" measurement. In fact some sadly refer to the VAR calculation process as "risk management". But in the end it just comes down to one thing: VAR is very much linked to some form of historical volatility. Under the BIS requirement, most use a 2-year historical period (or some other fixed time period). And therein lies the problem. The historical period deployed may be capturing a time of relatively low volatility, resulting in a risk measure that is considerably lower than the actual risk in the portfolio. And as long as the business understands the limitation of such a measure, there is no issue. But when banks allocate capital and set limits based on VAR, it can have all sorts of unintended consequences. Below is a VAR measure over time on a $10 MM position in S&P500 based on a two-year rolling window (for each day it looks back to what the volatility was in the previous two years). If the period happens to be over a mild volatility range, the VAR measure becomes skewed to the low side. In the middle of 2007, this chart shows VAR on the position that is over three times lower than the VAR on the same position now. That is for the same VAR limit a trader could have over three times as much in S&P500 as she can now. It is truly a perverse way of thinking about risk, as it lulled banks in 2007 into increasingly large positions. A $10 MM position in S&P 500 is probably no more or less risky now than it was in 2007 (many would argue that in 2007 it was more risky, rather than a third the current risk). As historical volatility became lower, the capital requirements to hold the same trading positions gradually dropped, allowing banks to take on more risk. Now a two year period includes 2008 and everything looks extremely risky. But here is the kicker. As the second half of 2008 moves out of the two-year window (which will happen in the fall of 2010), the VAR measure will drop again assuming volatility stays mild (as it has been recently). And bank capital usage will drop allowing them to take on more trading risk. It is mind-boggling to see regulators so committed to such capital requirement techniques. In effect this approach is a path to building asset bubbles. Banks increase risk (inflate the bubble) when volatility is low because they have excess capital. But they are forced to rapidly reduce risk (pop the bubble) when volatility increases because their capital requirements go up. But it's exactly during those periods of high volatility when banks don't have enough capital, forcing rapid unwinds and increasing volatility even more.